1. Preheat the oven to 180C/160C fan/gas mark 4. 2. Cream the margarine, yoghurt and sugar together until well mixed. Add the eggs and beat in – they may curdle, but just ignore them; all will be fine. Sift over the flour and salt and fold in, to a smooth cake batter. 3. Divide the batter evenly between the two cake tins and bake for 20-25 minutes, until a skewer inserted into the centre of the cake comes out clean. Remove from the oven and allow to cool in the tins for five minutes, then invert onto wire racks to finish cooling completely. 4. For the filling, put the sliced rhubarb and sugar into a saucepan with a drop of water. Bring to a boil, stirring, then reduce to a simmer and cook down gently, stirring frequently, until thick and jammy – about 15 minutes. This can be as thick as you prefer, but do remember that it will thicken even more once cool. Pour onto a plate and allow to cool completely. 5. 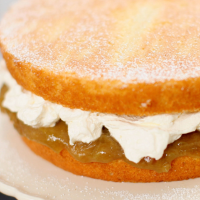 Once the cakes have cooled, place one onto a cake stand or plate and spread over the rhubarb jam. Whip the cream to soft, floppy peaks and drape that over the jam. Top with the second cake and dust with icing sugar.